Firefighters can't determine what sparked a massive fire that ripped through a historic building in downtown Harriman last month. For more than a week after a fire burned the Miller and Brewer Building to the ground, firefighters dug through the rubble, searching for evidence as to what started the massive fire on Jan. 8. Harriman Fire Chief Brad Goss said the fire was so hot, it destroyed any clues that firefighters could use to figure out what happened. Update: On Friday, Harriman Police reported that they had identified the two possible witnesses to the massive fire at the Miller and Brewer Building. They have not released any further information at this time. (WBIR - Harriman) The Harriman Police Department is asking for the public's assistance in finding two people who may have witnessed the cause of a fire that destroyed a historic building earlier this month. (WBIR) Roane County's Board of Education held its first budget meeting Wednesday night as it prepares to deal with a massive money shortfall. The school system has a $3.5 million deficit. The district's fund balance that it has used in previous years has run out, so it either has to increase revenue or cut programs. Roane County's Director of Schools said for a system that size, a cut that big has a huge impact. 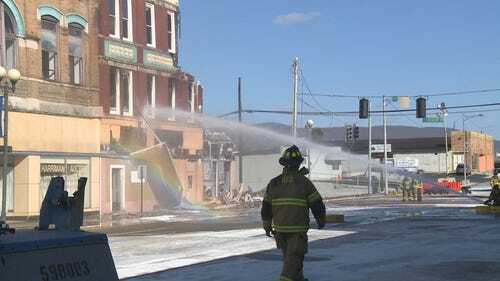 HARRIMAN - A contractor will start removing debris to reach and finally douse the fire that's been burning five days and destroyed a historic downtown Harriman commercial building. City officials agreed to spend up to $240,000 if necessary and will hire Ace Inc. to address the lingering fire that broke out Thursday afternoon in the old Miller & Brewer Building, once one of Harriman's largest buildings. It served for many decades as a department store and then later was used for apartments. A house fire claimed the life of a Harriman woman Monday afternoon. According to Chief Randy Heidle of the Harriman Police Department, firefighters were called to the fire on Margrave Drive at 1 pm and discovered the victim, Francis Anne Snow, 65. Firefighters said the fire started in a back bedroom, but no cause has been determined. Other family members lived in the home, but only Snow was home when the fire broke out.